After seeing the movie “Open Season”, my son decided he wanted to be “Buddy the Porcupine” for Halloween. My first thought was “How the heck am I going to pull that off? 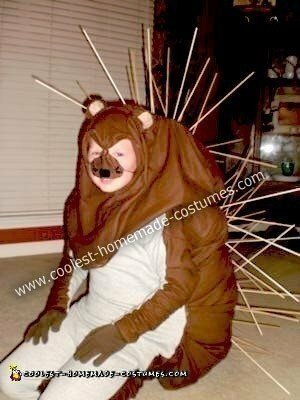 !” Well, I decided the best way to achieve this Homemade Playful Porcupine Costume was to dive in head first! I always make my son’s Halloween costumes, and I have found that the best way to start is with a sweat suit, that way, I can rip seams when Halloween is over and he can have a perfectly good sweat suit! Well, this year was no different. I purchased a sweat suit and felt, along with cotton batting, Styrofoam, and mini wooden dowels. I would have used skewers, but I didn’t want anyone to really get “poked”! I knew I needed a lot of excess padding in the back for comfort, so I used the felt, sewed it to the sweat suit, and stuffed it with cotton batting. Then I put the Styrofoam to hold the dowels in place. Once I got everything sewed together, I started sticking in dowels. I had to use a little hot glue on the end of each one to keep it in place, and had to “start” a hole for each one with scissors for easy “poking”. I stuck dowels and stuck dowels till I felt his “quills” were sufficient! That is how we came up with our “Homemade Playful Porcupine Costume”!